Every day is different. 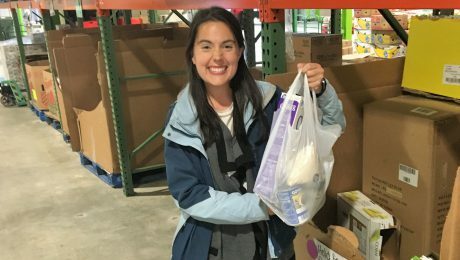 I have enjoyed all my shifts at the Food Bank CENC, but I have really enjoyed the relationships that I have formed with the other volunteers and employees. Jacqueline uses our Mobile Kitchen Kits to teach children all about healthy foods and how to prepare them. Even the vegetable lesson was a hit! My name is Jenny Ryan and I am the new Nutrition Education Coordinator. I am excited to be out with the neighbors we serve to showcase easy low-cost recipes across our 34 counties. It’s been several months since Hurricane Florence hit, and then lingered over North Carolina, impacting almost all the Food Bank’s 34-county service area. We knew immediately that recovery and rebuilding would take along time, and the Food Bank committed ourselves to supporting our friends and neighbors for the long haul. President/CEO Peter Werbicki: It’s important to continue to remember the children, seniors, and families who were hit hardest by the storm. Many have lost everything. For those who were already struggling to provide for their family’s basic needs, the flooding is even more catastrophic. And unfortunately, many these folks have a long recovery still ahead. “It’s hard to believe that people could survive on so little,” Chris said after looking at the qualifications for the CSFP Program. “Unfortunately, it is all too real.” Nearly 50,000 seniors in our 34-county service area live at or below the poverty level. January 28, 2019 in Volunteer. Adelphia CDC Inc. is just one of the organizations that was able to rise to the occasion and help the many people impacted by the recent disasters. January 28, 2019 in Disaster Relief. Food Bank CENC and the Feeding America network are here for anyone who needs us – or anyone who wants to provide help. We will continue to share more information here as it is available. January 24, 2019 in Uncategorized. When invited to tour the Raleigh Branch facility, my answer was obviously, heck yes! January 4, 2019 in Guest Blog. October 24, 2018 in Disaster Relief. September 11, 2018 in Disaster Relief. August 13, 2018 in Community Stories. August 13, 2018 in Message from our CEO. What does the Farm Bill mean to the Food Bank and the people we serve? August 13, 2018 in Public Policy. August 13, 2018 in Spotlight.